Historic Chatham County Courthouse, 9 Hillsboro St. The Chatham Historical Society has invited Linguistics professor Walt Wolfram from NCSU to speak at the Chatham History Museum. New Horizons Sale on Facebook Live! Check out the New Horizons West Facebook Page at 6:30 on Friday, February 22, and watch Mary & Catherine show you everything that's on sale! Carolina Tiger Rescue's annual Black Tie & Tails Ball will be held at the Washington Duke Inn on February 23. Get your tickets soon! Pittsboro Roadhouse, 39 West St. Celebrate all things green at TickWarriors St. Paddy's Day Celebration, Open House, and (Alpha-gal friendly) Oyster Roast! Visit our new international headquarters at The Plant in Pittsboro and check out our latest specials, draw a prize from our pot of gold (everyone wins! ), and play Tick Trivia! Are you interested in starting a backyard flock, but don't know where to start? Come in to Pittsboro Feed and check out our Chick Chat on April 6th! BUT don't worry, if you cannot attend we will be having it on here LIVE and saved to our Facebook page! 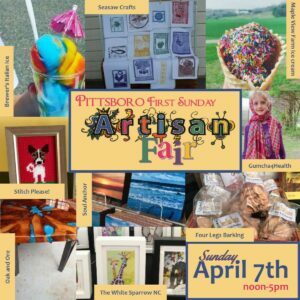 On the first Sunday of the month from April through December from 12-5 p.m., downtown hosts the Pittsboro First Sunday Artisan Fair & Market. This family-friendly event has live music, food trucks and dozens of vendors selling art, jewelry, textiles, woodwork, soaps, pottery and more. There is a designated play area for children in the parking lot across from Pittsboro Roadhouse. Many businesses host their own sales and events. Pittsboro's First First Sunday of 2019! Joyful Jewel, 44-A Hillsborough St. In conjunction with the opening of the 2019 First Sunday season, The Joyful Jewel will be hosting Beth Bale's opening art reception from 1 – 3pm, and The GEB will be playing a life music concert 3 – 4:30 pm. State Farm Agent Pam Herndon is hosting a first-time homebuyers class. Dinner included, at the North Chatham Village Office. (Cole Park Plaza.) RSVP. Maple View Ice Cream invites you to the second annual Breakfast with the Bunny! Join Mark & Carol Hewitt as they celebrate the 100th firing of the kiln at the W. M. Hewitt Pottery! 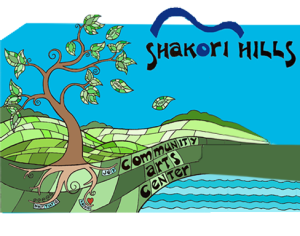 See their website for details about times, music, food, and more. Stop by New Horizons West on Earth Day, April 20, and help them celebrate everything you do outdoors! Sales, food, music and fun throughout the store.